Everything in life is built on a foundation of some kind, be it a building, a relationship or an idea. If you look back in history over the latter, few will have come from foundations built by the people who made them a success. In short; foundations are laid and if that person doesn't manage to see it through to fruition then others will come along and do it. This happens all the time in the business world and many people see themselves as a failure id they have laid the foundations but don't see the end success. There is a clear message behind these inspirational corporate ecards entitled Forrest Success. The image is of a blanket of bluebells which nobody knows who planted them there in the first place. 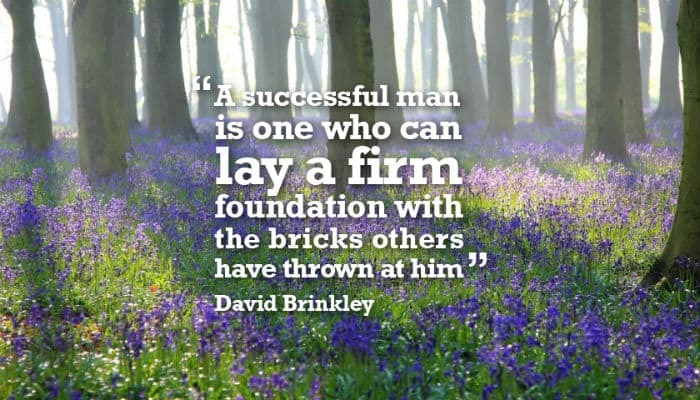 So whether you build foundations or just see the end result, it can be classed as a success. The words on the ecards read “A successful man is one who can lay a firm foundation with the bricks others have thrown at him”. In other words, everything comes down to teamwork, the backbone of the business world, and by sending these ecards you may just make someone realise this. How does your business choose to celebrate Christmas with your clients? If you want to consider ecards then we are the leading suppliers of e Christmas cards for business.